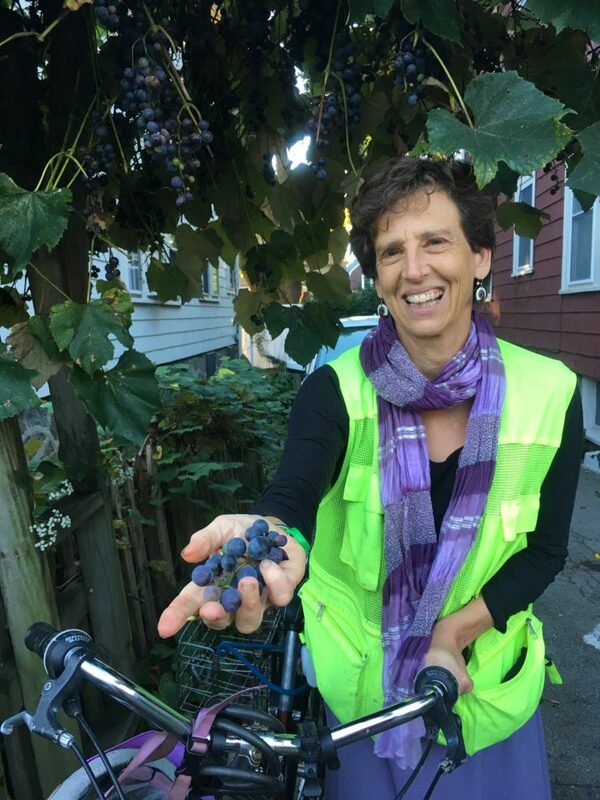 I have lots of bike stories because I’ve been biking all over since 1992. A Lot of people say, ‘Oh I wouldn’t bike. I’m afraid of being hit,’ but I haven’t really had a serious experience like that. In general my biking stories are very happy. It’s the best way for me to get around. When I arrive at work, I’ve had outdoor time, I’ve been breathing well, and I don’t have that restless feeling, so I’m just easier to be around for all my coworkers. It’s all around a good thing when I can bike. Some snowy winters, I didn’t bike for 4-6 weeks or something. I like reading on the T. It’s a nice change of pace. I don’t get to work and feel so hungry. But then I’m always just so happy to be back on my bike. It’s just such a mental health thing as much as it is a physical health thing. I like biking to Carson Beach and then walking and collecting trash. I like to swim. I like to have that as a destination. In ‘99, I decided to bike across the state. I drove to Western Mass., left my car for my aunt to bring back, and I started by doing about 20-30 miles at a time. It was right around Memorial Day, and in Western Mass. the lilacs were blooming. In Central Mass, the lily of the valley were blooming. I feel in general very fortunate and I am so grateful. This week in particular, I was thinking, how excellent [it is] that Fog X FLO is installed and there’s somebody who puts art in my commute for me. I don’t have to go one pedal out of the way for it. And then, in the spring, the Brookline Open Studio group or something installs art near the Longwood station, and I love all of those installations. Every year, that’s right around my birthday. So I feel happy about those. For all that I’ve biked around … I don’t feel like I have the best ways to maneuver into South Boston and from South Boston to, say, Charlestown. I did that recently. I think there might be new harbor paths that might be bike accessible — or maybe they’re not. But I wish that I knew those better. 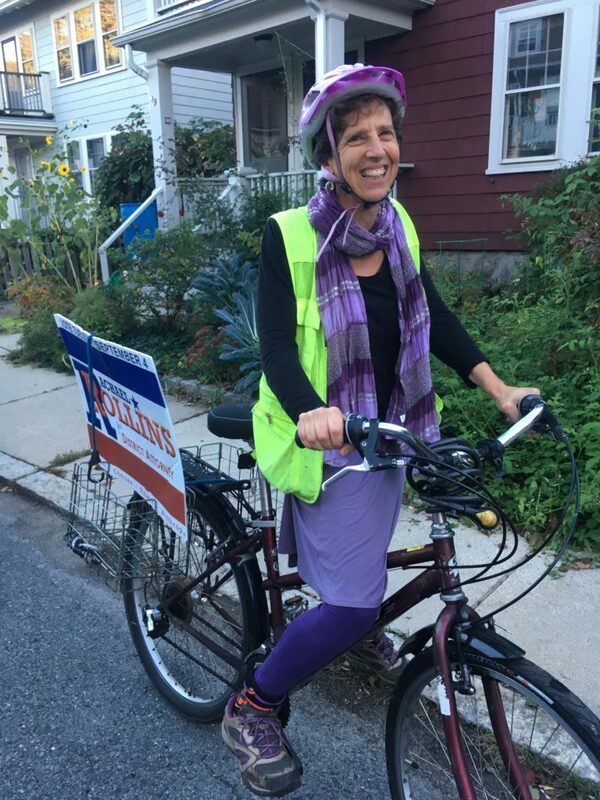 I never go super out of my way to convert people to biking, but I try to be a bike role model and I definitely feel like a cheerleader, “rah rah.” A happy memory is when [my friend] wanted to start biking, I would be able to show [her] different routes and facilitate that to some degree. I would like to think that I might be doing that in small ways for other people, even though I don’t see it. Before I had really good panniers, I was using a lot of bungees. I had a backpack. I must have had some workshop materials. I had a few tote bags on the back of my bike, and I was commuting from where I worked in Allston/Brighton home to JP. On the way, I stopped in Brookline at a boutique that sold beads, because the next day I was going to a meeting that was a goodbye party. Everybody was supposed to bring a bead, and I don’t remember if we were going to make a bracelet for her or just talk about the significance of her work related to the beauties and colors we had chosen — something like that, something meaningful. So I stopped, and I didn’t want to un-bungee everything and take it off my bike and bring it in, but I also didn’t want to leave it unattended. So I brought my bike into this boutique, and I parked it by the door, and I picked out my bead, and as I turned to pay, the woman behind the counter said, “no bikes in here, you have to move that.” And I was like, ugh, it’s just for a minute, do you want me to move it somewhere else? She told me, yes. and so I moved it. I went to pay her, and as I did I saw out of the corner of my eye my bike falling, falling, falling, falling toward this vase that was easily like three feet tall. It was this huge Mexican vase, and suddenly it was in pieces on the floor. So yeah, everybody goes silent. The owner comes stalking out from the back with this big scowl on his face, and before he can say anything to me, I just tell him, I’m like, “I’m not paying retail for that.” I think I was strapped for cash. So we negotiated, and I was like, “I’ll come back with a car and get this huge Mexican vase,” which was really heavy and now in pieces. I went home and I was just shaking, because I’m just my own worst enemy. I had that vase out in the living room for quite a while. I glued it back together.